Fire Safety Product of the Year 2017 Finalist – 2nd year running! 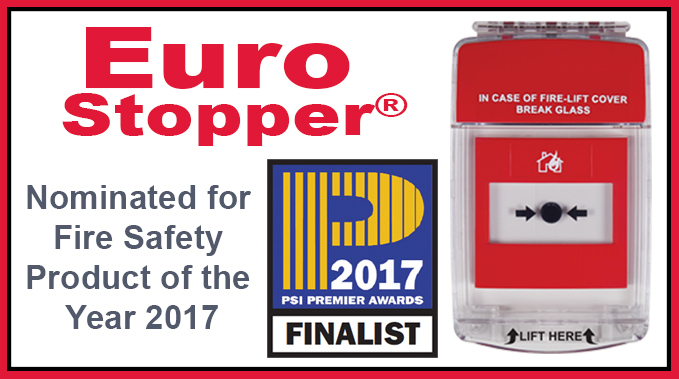 The Euro Stopper has been nominated by the readers of Professional Security Installer Magazine (PSI) for the Fire Safety Product of the Year 2017. 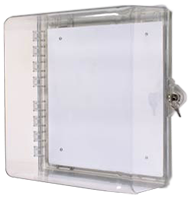 The Euro Stopper consists of a clear, tamperproof, tough polycarbonate cover and frame that retrofits over the break glass call point and prevents accidental or malicious false alarms. The newest call point protector in the Safety Technology range, the Euro Stopper comes as standard with a unique substance that glows in the dark embedded in the frame. The Glow Guide pigment will release light for up to 8 hours in darkness or dimly lit areas and charges up after only 30 minutes exposure to natural or artificial light. It is essential for guiding you to safety in emergency situations. The Glow Guide is not the only unique feature to the Euro Stopper – the polycarbonate cover is supplied in a self-assembly kit form. The Multi Kit allows users to assemble the product to suit their desired application, with the choice of red or green housing shell. There are models available for flush and surface mount applications, with the choice of sounder or non-sounder. All Multi Kits are supplied with Multi-Lingual language labels and space to allow for dual language operating instructions. Five alternative colours are available to suit a wider range of applications. Every false fire alarm is costly, disruptive and detrimental to safety. Beyond disruption, false fire alarms have a significant impact on the effectiveness of a fire evacuation strategy and may put the lives of staff, students and visitors at risk. If a genuine fire alarm is mistaken for yet another false alarm and, therefore, ignored, the consequences could be fatal. on +44 (0)1527 520 999 or email sales@sti-emea.com.